I grew up in Calgary, AB, where I spent almost all of my free time skiing, backpacking, climbing, hiking, and exploring in the Rocky Mountains. All this time spent outside led me to pursue a degree in Natural Resources Conservation. I have just completed my second year of studies in this program. 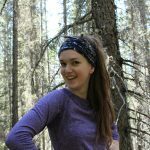 Since beginning my undergraduate degree, I have learned that forestry is an extremely unique area of study with so many areas to explore. Areas of particular interest to me are fire ecology, environmental policy, climate change, and plant biology/ecology. My love for the outdoors has continued since moving to Vancouver, so the best part about pursuing an education in an area like forestry is that you can take your passion outdoors! Having the opportunity to work with the Tree Ring Lab has quickly opened my eyes to all of the incredible areas of research that rely on dendrochronology. I’m excited to work with the Tree Ring Lab this summer and continue to learn about how fire influences landscapes, local communities, and forest dynamics.